The blackaxe fraternity is one cult group in Nigeria with a very huge member of popular celebrities. 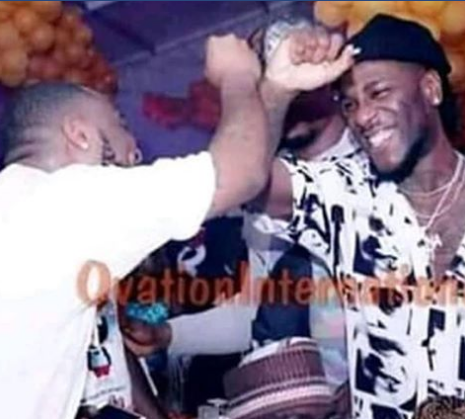 Just recently, two of Nigeria's currently trending musicians, Davido and Burnaboy were knacking "egede" which is the official handshake of the blackaxe fraternity. Knacking of egede is the fraternal greetings of members of the Neo black movement of Africa aka black. Egede which means victory is most times carried out by members of the blackaxe cult group during ceremonies or parties. Davido and Burnaboy were in the party mood at a club when they were spotted knacking egede. Nonetheless, the act doesn't take away the talent Davido and Burnaboy has but do they think of their safety? they are celebrities for whats sake? There are other celebrities like Tuface, Tony one week, Emeka Ike, Timaya, Flavour etc who are members of secret cults but do not show it often.